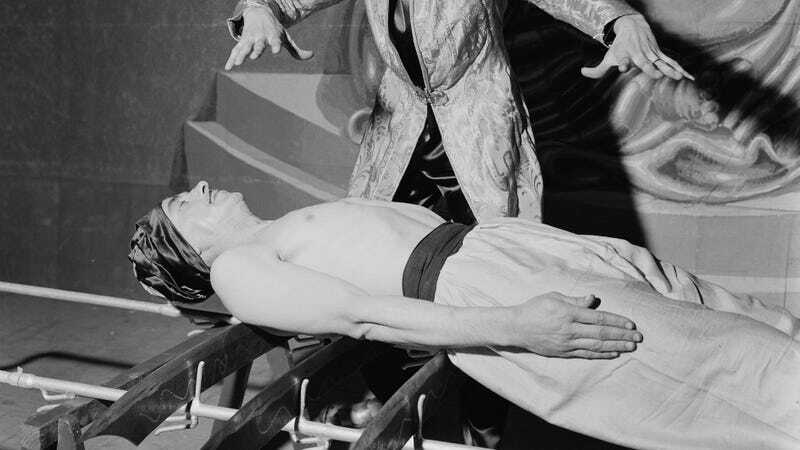 Yarto Yowa the fakir causes his assistant to lie on a bed of swords in Rome, circa 1950. What it’s about: Dying is easy. Comedy is hard. So goes the old actors’ saying, and sadly, some know from experience. Through the ages, actors, musicians, and other performers have gone out on a high note, leaving this mortal coil before the crowd could ask for an encore. Biggest controversy: Another old saying goes, “Guns don’t kill people—no, wait, that’s stupid, of course they do.” The “bullet catch” magic trick, which felled last week’s subject, the white man who performed as Chung Ling Soo, has claimed many magicians. In 1820, Madame Delinsky was accidentally shot when one of the six (!) gunmen shooting at her mistakenly used a live round. In 1840, Arnold Buck gave a gun to a volunteer from the audience, who used a blank bullet per the trick, but also surreptitiously inserted nails into the gun barrel. Guns are deadly to non-magicians, too. In 1984, Jon-Erik Hexum was bored on the set of the TV series Cover Up, unloaded the blanks in a prop gun and amused himself by pretending to play Russian roulette. Except he had forgotten to unload one blank, and had the bad luck to spin the cylinder to that chamber. The force of the blank firing at close range was enough to kill him. And famously, Brandon Lee was killed in 1993 while filming The Crow when a prop gun was improperly loaded, causing a blank shot to propel a bullet stuck in the barrel from a previous misfire at Lee. Not all onstage gun deaths are accidental. Jazz trumpeter Lee Morgan was shot and killed on stage by his wife in 1972. Pantera guitarist “Dimebag” Darrell Abbott was performing with his post-Pantera band, Damageplan, in 2004, when a gunmen leapt on stage, shooting and killing Abbott and three others. And in 2013, Brazil’s “King Of Funk,” MC Daleste, was shot in the abdomen in front of a crowd of 4,000 people, dying later that day. Strangest fact: One of the numerous traditional actors’ superstitions (and for those of you out there reading, good luck, and… Macbeth! ), the color green being bad luck dates back to one of the earliest recorded (at least, by Wikipedia) onstage deaths. French actor and playwright Molière, whose works are still performed at the Comédie-Française more than any other playwright, died in 1673 while starring in one of his own plays, Le Malade Imaginaire (The Hypochondriac). Contrary to the title, Molière had a very real case of tuberculosis, had a violent coughing fit during the play, and died on stage. He was wearing green at the time, and the color has been bad luck ever since. Thing we were happiest to learn: Not much to be happy about on a list of deaths, apart from some lives well lived. In 2016, Jane Little, a bassist with the Atlanta Symphony Orchestra collapsed at the end of a performance’s final number, “There’s No Business Like Show Business.” No one knew that better than Little, who died at 87 after performing with the orchestra for 71 years. The following year, jam-band staple Colonel Bruce Hampton died on his 70th birthday, surrounded by friends and admirers, during an all-star concert to honor the occasion. Thing we were unhappiest to learn: Wrestling may be fake, but the danger is real. In 1969, Mike DiBiase (adoptive father of Ted “The Million Dollar Man” DiBiase) died of a heart attack in the middle of a match. Three years later, Luther Lindsay, one of the first black pro wrestlers to become a major star, died while performing the winning move in a match. In 1987, British wrestler “King Kong” Kirk died of a pre-existing heart condition when his opponent landed on him. In 1993, Larry Cameron died of a heart attack during a match. Japanese wrestler Mitsuhara Misawa and Mexican wrestler Perro Aguayo Jr. each suffered cervical spine injuries in the ring which led to immediate cardiac arrest and death. And in 1999, Owen Hart (brother and tag-team partner of Bret “The Hitman” Hart) made his entrance to a pay-per-view event gliding down from the roof of the arena, when the safety harness released, dropping him 78 feet onto the ropes. His aorta tore, his lungs filled with blood, and he died shortly after. Further down the Wormhole: Hard to believe it’s been 12 years since The Crocodile Hunter star Steve Irwin was killed by a stingray while filming a nature documentary. Besides introducing a generation of viewers to wildlife of all sorts, Irwin was a devoted conservationist, working to protect endangered animals and habitat, and protesting poaching-derived items like turtle shells or shark fin soup. Shark fins are usually fished by removing them from a shark and throwing its body back into the sea, and overfishing is endangering shark populations around the world. (While the movies make sharks out to be terrifying predators of humans, in fact the reverse is true, with sharks killing a single-digit number of humans each year and humans killing millions of sharks.) The United States has made some efforts to protect some sharks, in no small part because of the landmark court case United States v. Approximately 64,695 Pounds Of Shark Fins. We’ll look at the best case name in the law books next week.